200 tenants, trade unionists and councillors joined MPs, academics and housing professionals at the Defend Council Housing national conference at the TUC in central London last Thursday. Plenary speakers included Austin Mitchell MP, Jack Dromey, deputy general secretary T&G; Cllr. Margaret Wilkinson, Vale of Glamorgan; Frank Dobson MP, Heather Wakefield, UNISON head of Local Government; Michael Hall, chair Leeds Tenants Federation; Professor Peter Ambrose; Wilf Flyn, UCATT Executive Council; Paul Holmes MP, DCH chair Alan Walter; Gail Cartmail, Unite-Amicus assistant general secretary, Frances O'Grady, TUC deputy general secretary; Tricia Clark, CWU and George Galloway MP. Read interim report on-line or print off A4 document. The press has finally picked up the 'invest in council housing' story. "The new government has to make clear proposals - backed up with a definite timetable - on three issues: enabling councils to improve all existing council homes and estates; starting a new council house-building programme; and ensuring that local authorities can maintain all council housing as first-class housing in years to come." Saturday's Guardian said "We will want to be certain that the government will fund both improvements to existing homes as well as building new ones. We will also want to know what the minister [Yvette Cooper] will do about councils where tenants have voted against their homes being transferred". BBC local radio and TV have been discussing a new expansion of council housing and why tenants oppose privatisation. "I've never felt so optimistic about getting what we've been fighting for because change is definitely in the air… [but] I have to say, we won't be fooled again! Because we want now to push those policies forward and make sure the government fulfils them, not just pretends to fulfil them, doesn't do window dressing; what we want is real substance…." This isn't a spectator sport! Contact MPs this week and urge them to sign EDM 136 Funding Decent Council Housing and support the five demands agreed at the DCH conference. Organise a Hands Up for the 'Fourth Option' photo opportunity for the local press with tenants, trade unionists and councillors. Ask your MP to come too. Gordon Brown used the Labour Party National Policy Forum meeting on Saturday to talk up the role of local authorities. Firm proposals will be set out in a Housing Green Paper published before Parliament recesses in two weeks. Speakers at the DCH conference welcomed the sound bites about councils building new homes but all made the point that we need more than 'warm words'. We are not about to accept councils gifting valuable public land to public/private partnerships in exchange for a few token council homes in 'mixed developments' and government turning its back on existing council homes and estates. 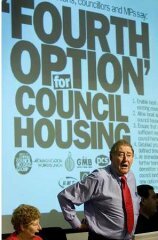 As the motion passed at Labour's own conference last year put it "A Labour government cannot leave council tenants who have rejected privatisation without improvements... Conference again calls on government to provide the 'fourth option' of direct investment to council housing as a matter of urgency". Download DCH conference interim report DCH conference policy statement New model motion latest DCH newspaper new posters 'Fourth Option' 2006 Labour Conference composite motion.